Kenny Shiels and Jimmy Nicholl will be announced as the men tasked with leading Killie next season. 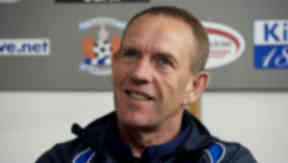 Kilmarnock have confirmed that Kenny Shiels is the club’s new permanent manager after the Irishman worked as interim boss at the end of last season. Shiels will be assisted by Jimmy Nicholl, who has left his post at Stenhousemuir to move to Rugby Park. The duo have been widely expected to be handed the responsibility of taking the club forward after previous manager Mixu Paatelainen left in March to take charge of the Finland national team. Shiels was in temporary charge following the Finn’s departure and has impressed the Kilmarnock board enough to be given the nod to plan for next season. Killie impressed with both their results and their style of play last season, finishing in fifth place in the Scottish Premier League. However, Shiels faces a rebuilding job after several key players left the club at the end of the season. Alexei Eremenko won admirers for his performances in midfield but the the Finn has returned to Metalist Kharkiv after his loan period expired. Craig Bryson has moved to Derby County and defender Frazer Wright has agreed a switch to St Johnstone. The club have been given a boost though with the news that highly rated goalkeeper Cammy Bell has agreed a new two-year contract despite interest from teams in Scotland and abroad. “I want to be the number one keeper again and help the club stay in the top six,” Bell said.